(coo blanc) Literally “white neck” – white front quarters and black hindquarters with black or gray markings on the head. (coo clair) Literally “clear neck” – front quarters are tan, saffron, off-white, or shading to gray with black hindquarters. (coo nwah) Literally “black neck” – black front quarters and white hindquarters. (sundgow) Black with white markings such as underbody, facial stripes, etc. (shamwahzay) Brown or bay – characteristic markings are black face, dorsal stripe, feet and legs, ans sometimes a martingale running over the withers and down to the chest. Spelling for a male is chamoise. Two-tone Chamoisee Light front quarters with brown or gray hindquarters. This is not a Cou Blanc or Coo Clair as these terms are reserved for animals with black hindquarters. Broken Chamoisee A solid chamoisee broken with another color by being banded or splashed, etc. Any variation in the above patterns broken with white should be described as a broken pattern such as broken cou blanc. The sleek, short-haired, multicolored French Alpine tends to look larger, “rangier,” and fine boned with more space between the ground and the underline than other large dairy goats. Although the angularity and width should still be present, they may not be as obvious. The head may be as wide between the very alert eyes, but because it it longer, the width may not be as apparent. The “dish” in the bridge of the nose will be less severe, sometimes being almost straight. The muzzle may not appear to be as wide as deep, and the ears may be longer, although just as alert. Origin: France. Conformation and General Appearance: Large, rangy, fine-boned, angular, alert, graceful. Colors: Any color or combination. See above for variations. Udder: Capacious, well-attached, even, pliable, soft, with well-formed, conical, well-deliniated teats. Reproductive Organs: Well-developed, well-supported; two teats well-balanced and evenly spaced. 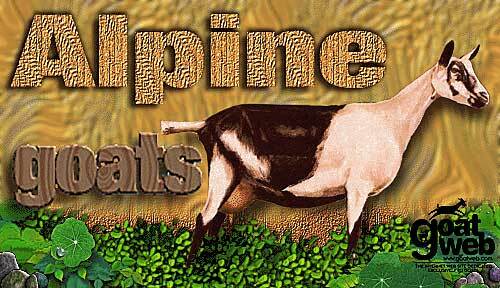 The Alpines International club is active in promoting the accomplishments of the Alpine breed in both the milking parlor & the show ring. We offer members an informative brochure, bimonthly newsletter, advertising & doe photos on the Alpine page in the Dairy Goat Journal, participation in the All-American Program & Alpine Specialty shows, & publication of performance scores in the club newsletter.